The December 1987 issue of Zzap! 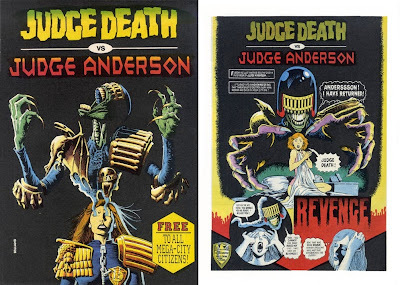 64 carried a 16-page bound-in supplement featuring "Judge Death vs. Judge Anderson", a colour reprint of the opening episode of Anderson PSI Division's solo debut from two years earlier. The popular Anderson had first appeared in 2000AD in 1980 but was, by 1987, a regular in her own strip. The supplement featured 10 pages of "Revenge" drawn by Brett Ewins and coloured by John Burns. The cover and centre-spread pin-up were by Brian Bolland, whilst Ewins provided the back-cover pin-up. The remaining two pages were taken up with an advert for Titan Books, who co-sponsored the supplement along with Fleetway Publications and Piranha, and an advert for the game itself, which revealed it would be available on the Spectrum, Commodore and Amstrad cassette for £9.95 and on Commodore and Amstrad disc for £14.95. It's very near to the kind of science fiction very popular in Hungary. It's a crooked kind of science fiction with lots of violence and bloodshed. And the technological gadgets are already well-known through other authors so it's not totally new. Crash announced that it would be carrying a 16-page supplement with their Christmas 1986 number (issue 48) as well as a full review of the game. 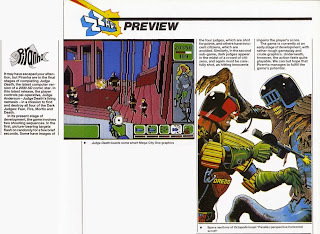 The supplement was also published in Zzap!, the companion paper to Crash, which also carried a brief preview in which it was mentioned that Piranha were in the final stages of completing Judge Death. "The game is currently at an early stage of development, with rather rough gameplay and crude graphics. Underneath, however, the action feels quite playable. We can but hope that Piranha manages to fulfill the game's potential." 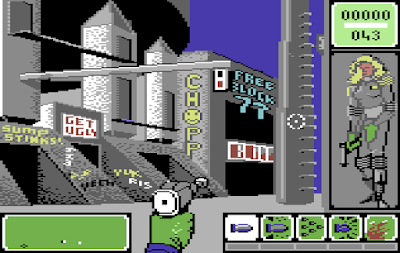 The main problem with the game was that they apparently used Koala Pad to design all the backgrounds, and unfortunately the C64 did not have the power to shift them around effectively. Pirahna were actually quite miffed with the conversion. As for Judge Death, well the game was developed in Hungary, but I remember the producers in London weren’t very pleased with the game. The original design for the game – done by a guy called Kevin Williams – was pretty good, but they hadn’t done a good job in coding it. The publisher wasn’t very happy with the game or the graphics, and I was drafted in to help to try to get the game up to an acceptable standard. I remember visiting the publisher to discuss with them what we could do. To start with the graphics weren’t very good, and too clean – there was no detail. So I added all the graffiti and background objects you see in the game. I didn’t have much time so i couldn’t do a lot. I did do some very nice C64 Dark Judges sprites, but unfortunately they didn’t end up in the game. Piranha had already announced that they were working on another 2000AD-related game featuring Halo Jones and were considering an Ace Trucking Co. game, too. It was not to be: Piranha went out of business before the Judge Death game could be released; Halo Jones never saw the light of day. Judge Death did, in a way, appear. 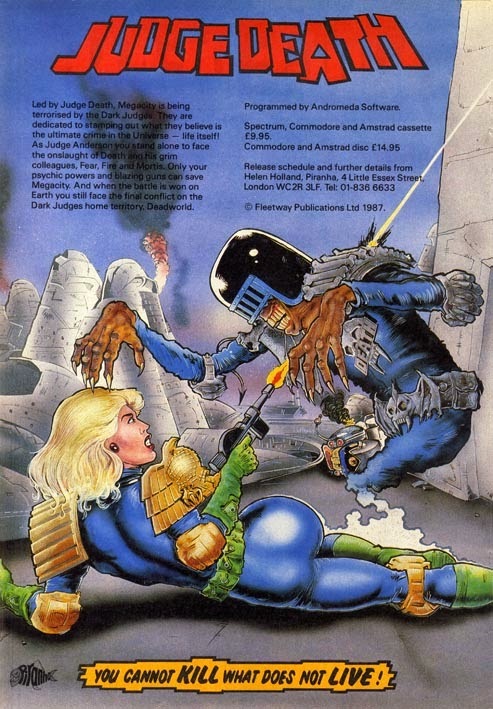 Piranha may have gone but the game elements were taken over by Novatrade, who removed any mention of Judge Death, Judge Anderson and Mega-City and released the game as Horror City in 1989. There's a review of Horror City here with screen grabs, and it is unmistakably the same game. The character Sinclair is clearly Judge Anderson. Graffiti scrawled on the walls of Horror City that reads "Sump Stinks!". "Get Ugly", "Chopp" will only mean anything if you remember Otto Sump or Chopper from Mega-City. 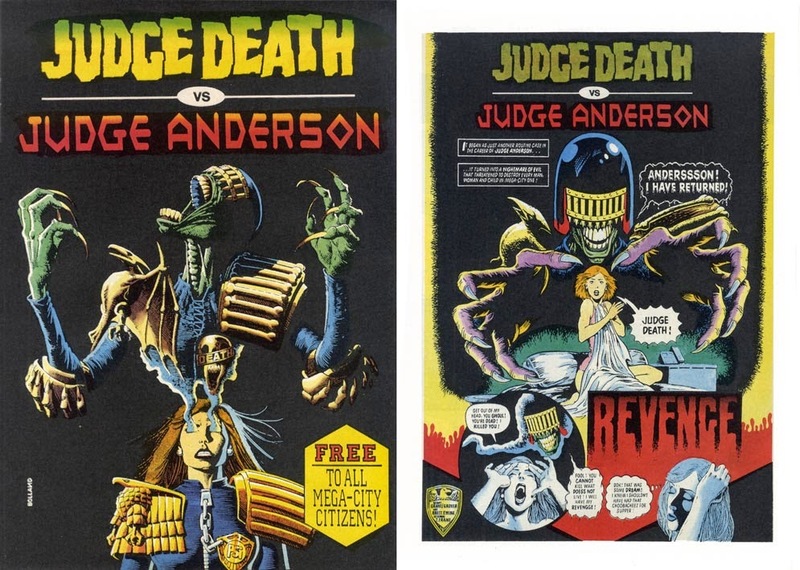 At some point Novotrade took the work that had been done on Judge Death, scraped away the top layer of 2000AD while still leaving the background details that clearly mark Horror City out as Mega-City One and released it under a new name. They probably shouldn't have bothered.